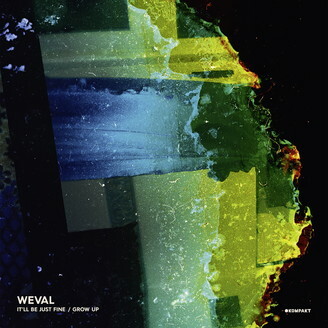 With the much-acclaimed EASIER EP (KOMPAKT 318), rising Dutch duo WEVAL presented an obscenely masterful label debut, dropping four intriguing tracks, but one fully-formed vision of their sound. The young producers' massive amount of talent couldn't help but manifest itself in incredibly catchy arrangements perfused with rarefied pop magic - a stunt they pull again on IT'LL BE JUST FINE / GROW UP, featuring two glistening cuts that marry serious beat science with heartfelt lyrics and soaring melodies. Being punchy and introspective at the same time is not necessarily an easy feat - you might expect that from seasoned veterans of prime time crowd control, not from two youngsters just starting to carve out their stylistic corner in the maze-like universe of electronic music. But here we are, still not believing our own ears, thanks to the bravura of Harm Coolen and Merijn Scholte Albers aka WEVAL when it comes to meticulously crafted electronic pop with character. Just as their earlier material, WEVAL's new offering seems at least partly inspired by personal events, making for a surprisingly intimate ride - a title like IT'LL BE JUST FINE can be taken as an obvious hint. But this is only one half of the story, as powerful synth hooks and interwoven lyrics unfold over intricate rhythmic patterns. The flipside's GROW UP slows down the tempo and takes a slightly more direct approach to drumming, adorning its steady throb with immersive vocals and existentialist melodies - again hitting that sweet spot between melancholy and hopefulness that we've already come to love in Weval's output.